At the press conference, Joon neither confirms or denies the rumors of Kang Hwi being gay and just states that they keep out of their entertainer’s private lives. However, since these pictures have been leaked and social criticism will follow, U Ent. can only do one thing—boot Kang Hwi out of Take One. This shocks everyone, from the press, fans, public, Kang Hwi, Man Ok, and Tae Ik. 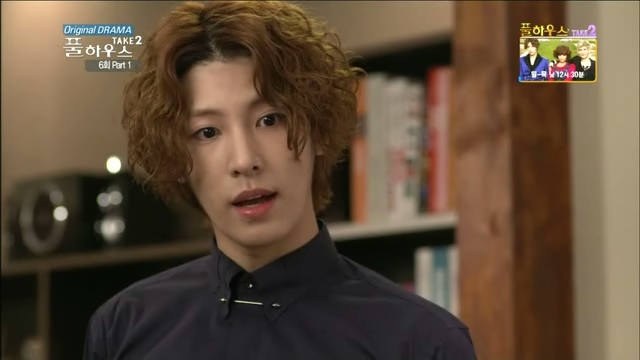 Of course, Tae Ik loses his temper and yells at the TV to know just what the heck is going on. This makes everyone’s eyes turn to him. Uh-oh. People then start asking if it’s true. Bum Soo rushes in and takes Tae Ik out while Man Ok bows and apologizes for the commotion. In the van, Tae Ik demands to know what’s going on from Bum Soo. The older manager should know, right? However, Bum Soo is just as lost and is desperately trying to understand the situation himself. Bum Soo says they should just go home first. Tae Ik doesn’t want to. He wants Bum Soo to turn the car around right now and go to the company. Bum Soo says even if he does, they won’t be able to get in because of the crazy mass of reporters outside. Man Ok then gets a text from Kang Hwi. Where is she right now? As soon as she’s able, she needs to call him. Oh, and not let anyone else know about him contacting her. Man Ok rushes to the dojo where Kang Hwi is hiding outside. They go inside and Kang Hwi gives her the lowdown (how Joon got him the plane ticket and said he’d handle matters, etc.). Then how did the pictures get leaked? Kang Hwi then says those pictures are probably from when he was waiting for her at Playground. Man Ok asks if he can’t remember anything. Nope, nothing at all. He remembers drinking alcohol. 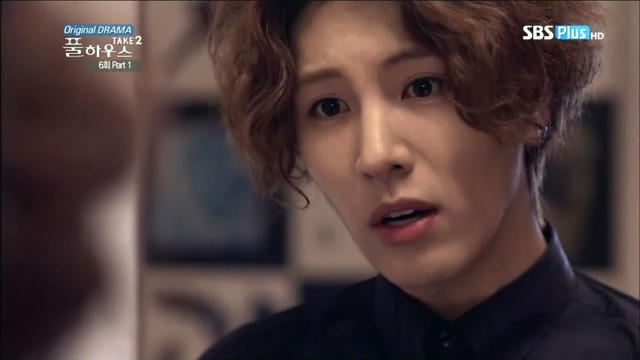 His eyes widen as he recalls Jae Hee’s arrival and seeing Jae Hee at the office. Kang Hwi gets up and yells “It was that jerk!” Man Ok asks what jerk he’s referring to. That Jerk, aka Fake Idol, aka Jae Hee, aka Jong Chul, is sitting getting his hair styled and gloating over the release of the news. 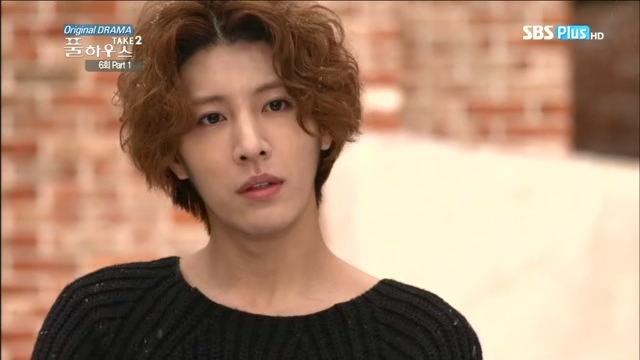 Joon made such a big deal and now this has happened, guaranteeing the CF goes to Jae Hee. However, Jae Hee is trying to figure out why L.J. (Lee Joon) would do such a thing. When his hair is done he gets a call from Man Ok Agency. LOL. Got to love how she uses her real name to lie (well…she gives him a fake name, but the agency name is her real name). 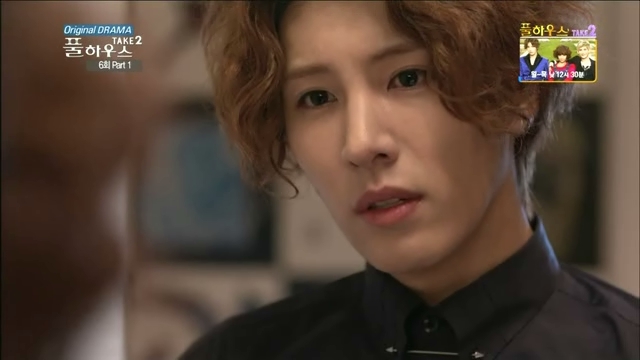 She asks him to come in and talk about the sports drink CF (now that Kang Hwi’s reputation is in the toilet). 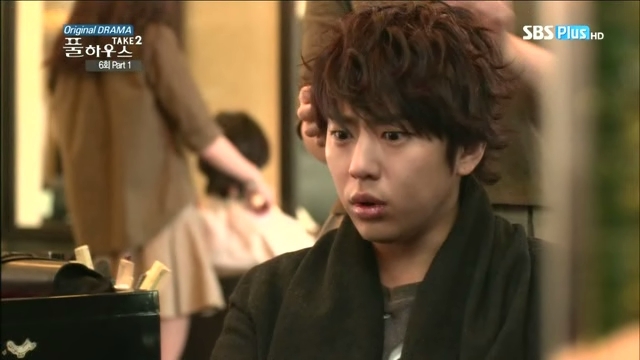 Jae Hee seems surprised. When Man Ok says that they are in a bind and can’t wait, Jae Hee quickly agrees to meet her. When he gets to the meeting place, there is Kang Hwi. When he tries to make good on his escape, Man Ok is right there and won’t budge. She twists Fake Idol’s arm behind his back and forces him into a chair. 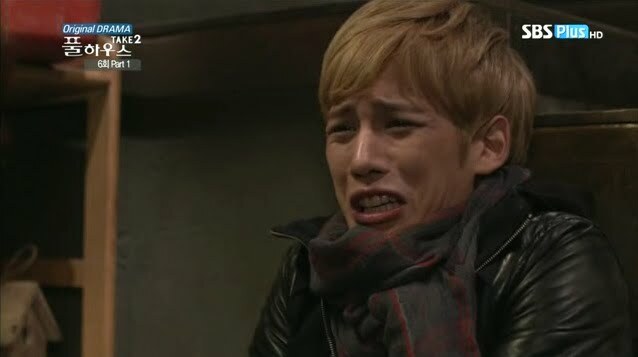 Jae Hee whines—why are they doing this to him? 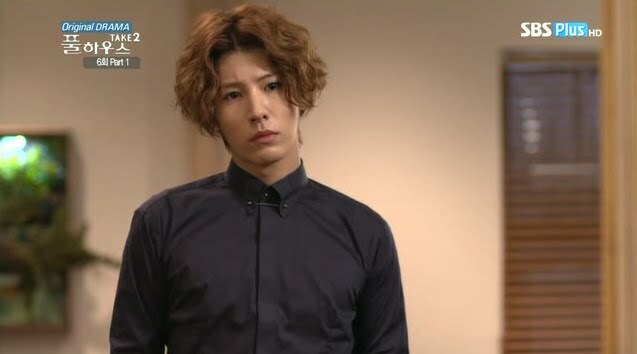 Kang Hwi sits down and returns the question with a question of his own—why did Jae Hee do that to him? Do what? Release the photos. Jae Hee insists he didn’t, but Kang Hwi doesn’t believe him since it was only Jae Hee who could have taken those pictures. Jae Hee says it wasn’t him and implicates L.J. before he thinks better of doing so and shuts his mouth. This surprises both Man Ok and Kang Hwi. Jae Hee says he gave the original photos to L.J. since Joon recorded the blackmail conversation. Jae Hee never would have imagined L.J. would release those photos himself, but Kang Hwi knows how terrible his company president is, doesn’t he? Kang Hwi doesn’t want to believe Jae Hee, but Fake Idol tells him to talk to L.J. and confirm it for himself. Kang Hwi takes out his phone and shows it to Jae Hee. It’s a picture of Jae Hee kissing some woman. If Jae Hee is lying to him, those pictures are going to hit the press. Jae Hee insists that it was all L.J.’s doing and a search will bring up the originals and tape recorder in Joon’s office. Jae Hee then is released and he complains about Man Ok’s strength and how he only went easy on her because she’s a girl. Sure. Whatever makes you feel better. 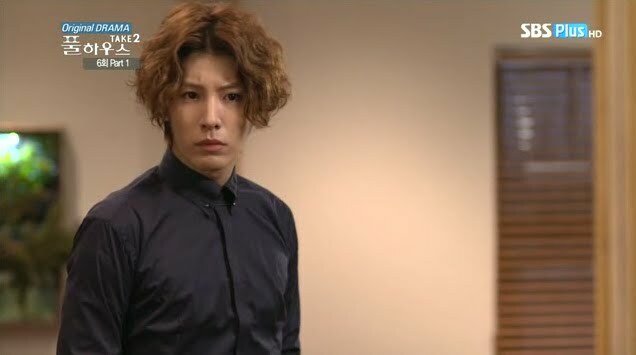 Man Ok and Kang Hwi then leave and Kang Hwi is essentially wearing a less fancy version of Man Ok’s original disguise that they used to fool Tae Ik. Man Ok worries that Jae Hee will tell reporters or Joon. Tae Ik says he won’t because he was ousted from U Ent. due to girl problems. If another scandal surfaces, Jae Hee’s career will be officially over. Man Ok then wonders why Joon would do such a thing. Kang Hwi doesn’t know either, so it’s time for them to enter the enemy base. Man Ok says the company is surrounded by reporters. Joon isn’t the type to keep such things at the company office. Then where? I’m thinking…Full House? Tae Ik is unhappily pacing in the house when he goes to Joon’s office where Joon is putting away the photos and recorder in a safe. Tae Ik slams the paper down and asks what’s going on since the photos are obviously fake. Joon calmly sits down and drinks his tea. He knows they are. They why? Kang Hwi damaged the team’s image, so regardless of whether or not the photos are fake, Kang Hwi had to pay a price. Tae Ik says that there was no damage. All of this time Joon has always been covering up Kang Hwi’s problems. Why is he suddenly doing this? What is Joon’s motive? 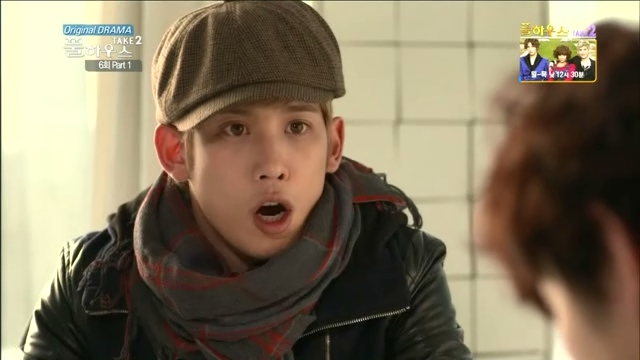 Joon is surprised. Shouldn’t Tae Ik be happy to have Kang Hwi ousted at long last (he has been talking of going solo all of this time)? Tae Ik says that no matter how much he dislikes Kang Hwi (blatant lie), doing this to him is not right. Kang Hwi and him are a team. Joon laughs. He didn’t know teams were so important to Tae Ik. If that was the case, why didn’t they show good teamwork onstage? Without asking Tae Ik, Joon can’t oust Kang Hwi. Joon laughs again. What power does Tae Ik think he has? The boy has nothing and Joon has it all. There is no way that Joon needs Tae Ik’s permission nor can Tae Ik overrule his decision. If Tae Ik hates it that much, he can give up Full House and leave as Joon won’t stop him. That seems characteristically un-Joon-like. Although, it’s probably a bluff since he knows how much Tae Ik wishes to get back all that was taken from him. Joon then says if he doesn’t have the courage, shut up and listen. Tae Ik shudders in rage and curls his fist. Joon then says it will be noisy for awhile so live as you are dead. He then kicks him out. Tae Ik has more he wishes to say, but can’t. 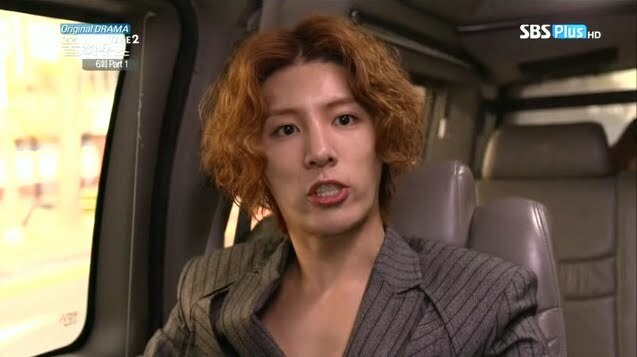 He slams the door as he leaves and Joon laughs. They are his puppets after all. Tae Ik goes outside and sits on the swing, recalling moments with Kang Hwi and what Joon just said. What will he do? He puts his head in his hands and then looks up surveying his childhood home. Would Tae Ik defy Joon at the risk of losing everything? It would be cool if he did as it shows how much a person matters more than clinging on to something that was lost. We all know that Tae Ik is a big softy at heart and really cares for Kang Hwi no matter how much he says otherwise. The stalkarazzi are busy planning their moves to get an inside scoop (which of course means stalking Man Ok). These three. I hate them. While the male reporter is wondering what to do, he happens to catch sight of Man Ok and Kang Hwi on her scooter and follows them. 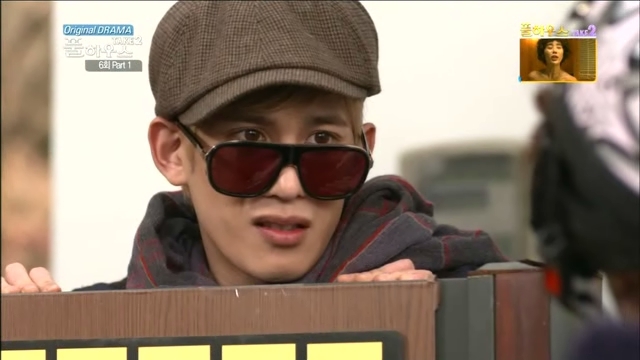 They get to Full House and Kang Hwi finds the bad part of the fence so they can sneak in. Man Ok is hesitant. What if they get caught? Why can’t they just ask Joon directly? 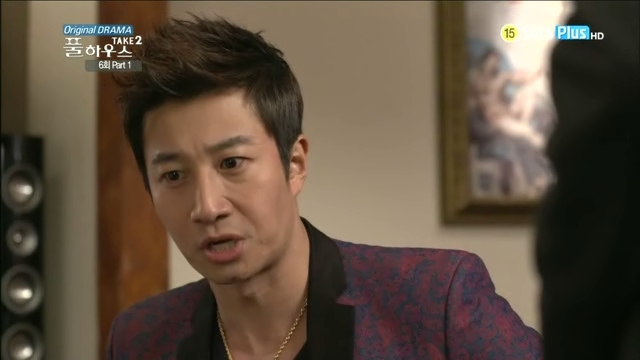 Kang Hwi says Man Ok heard what Jae Hee said. 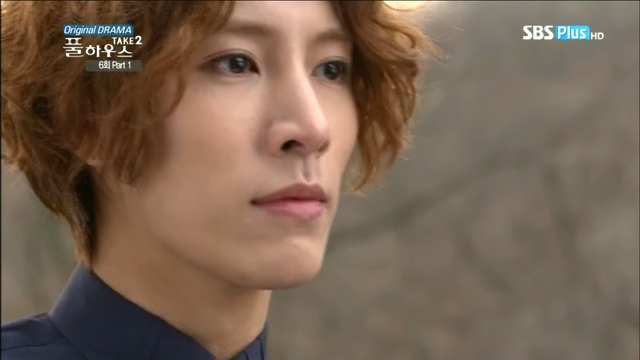 Kang Hwi shakes his head and says that Man Ok is the only one he can trust right now. She goes in first and then helps Kang Hwi in. Oh no. She did incidentally lead that scumbag right to Full House’s doorstep. I’d like to know what made him think bright yellow work clothes would be a good disguise, though, when he decides to stake out the place? Now begins the silliest and WORST sneaking in scene I’ve ever scene. Apparently Man Ok and Kang Hwi think that carrying a loan branch and walking hunched over equates as a disguise. You are SO obvious. Man Ok and Kang Hwi believe there’s someone there. Is it the president or Tae Ik? Kang Hwi assures her Tae Ik isn’t there because he hates the dark and no lights are on. Well, that’s one problem out of the way. But it appears someone is on the second floor. They should go to the basement and wait until the middle of the night when the coast should be clear. The two use Kang Hwi’s discovered secret passageway to get into the house. As they are sneaking in, the lights go on. Man Ok hurriedly shoves Kang Hwi through the door to the basement, sending him rolling down the steps. Omo. Poor Kang Hwi-nim! She then hurriedly shuts the door just as Tae Ik arrives. He’s startled. What’s she doing there? How did she get in? Man Ok, who is a HORRIBLE liar, tells him Go Dong gave her the number and that she’s there for work because she thinks she left some clothes behind. Clothes? What kind of clothes. PRETTY clothes. LMAO. Oh, Man Ok. Tae Ik then gets angry. In this kind of situation Man Ok is only worried about clothes? What about poor Kang Hwi? Tae Ik then kicks her out. He walks away, but turns around to see her peeking at the basement door again. WHAT is she doing, didn’t she hear him? Man Ok jumps and screams and turns the corner. She then peeks around to see him still standing and look at her. She then stops hiding and bids him goodnight before leaving. LOL. Poor Tae Ik. If he only knew. After she leaves, he turns on the “Crime Prevention” part of the security system. Hahahaha. That means Scumbag (Mr. Stalkarrazi) won’t be able to do anything. Scumbag is trying to climb the fence and figure out how to get in when he catches sight of Man Ok. She’s rushing out when an alarm goes off. Scumbag goes off running while Man Ok takes off and makes good her escape. I can’t believe that she successfully hid behind a light pole from security, but she did. BAD security. She then texts Kang Hwi (who is out like a light thanks to his fall) saying she can’t get back in and will be back early in the morning. The next morning she heads to the house and tries calling Kang Hwi. He finally wakes up and finds himself in the basement. He tries to get up and cries out in pain holding his ankle. Enter Man Ok. She asks if he’s all right. Kang Hwi, like a baby, says he’s obviously NOT okay. Man Ok wants to take him to the hospital, but Kang Hwi says that’s impossible at the moment. So Man Ok does some emergency care which is tying his injured ankle to a table leg. Kang Hwi comments on her nurse-likeness and Man Ok says it’s nothing. She’s a hapkido master and when doing sports, you get hurt. Thus, knowing first aid like this is pretty basic. So modest, our Man Ok. She tells him that it doesn’t look like the bone is broken, but she wants to take him to the hospital later just in case. Kang Hwi says that he won’t be able to walk with his leg. Man Ok then assures him she’s strong and will piggyback him to the hospital. Awww. Man Ok then brings out some sandwiches for him and says she will bring him some medicine. More than that, he wants his clothes and the emergency fund from his room. As Man Ok goes to his part of the house, she sees movers taking things out while Go Dong and Tae Ik watch. What’s going on. Go Dong is surprised to see her. When did she get there? Just now. Tae Ik then demands to know what is going on with all the stuff getting moved out. Go Dong replies that Joon told him to get rid of all of Kang Hwi’s things. That little b*stard. Tae Ik angrily goes inside while poor Go Dong tells Man Ok that he’s being suffocated to death. Awwww, poor Go Dong. He then says that Joon told him to have the stuff taken out since he’ll be remodeling, but that doesn’t seem right no matter how much Go Dong thinks about it. Man Ok then asks if she can take Kang Hwi’s important items in case he comes back to look for them later. Go Dong says Joon told him to get rid of everything. Man Ok then gets him to agree to turn a blind eye while she takes Kang Hwi’s things. What does she need? As Tae Ik is angrily marching to the office, he overhears Joon yelling at the secretary about Kang Hwi NOT getting on the plane. How is that possible when Go Dong saw him go through the gate? Where did he disappear to? They have no idea what kind of stunt the missing Kang Hwi will pull, so quickly trace his cell and watch all of his credit cards. Haha. You’re plan isn’t going according to how you want it to. Tae Ik just stands outside in shock. Man Ok has a rack of clothes and other items for Kang Hwi while Go Dong is overseeing the final removal. There is scumbag pretending to work. Go Dong gives him trash to take out and scumbag fishes through it all hoping to find something good. There was nothing in the trash bags and he starts going through the books and magazines when a picture flutters out. It’s the same picture that Tae Ik had with him, Se Ryeong, and Kang Hwi in bed together, only this picture had been cut so there is no Se Ryeong. Uh-oh. Hmmm…isn’t that odd? Why would Kang Hwi have cropped her out of the picture so only he and Tae Ik are visible? Did he dislike her that much? Well…probably. I don’t think he likes Tae Ik in “that” way. So if that girl ruined his and Tae Ik’s relationship which looked to have been good at one time… Of course, Scumbag believes this is big news (I’m guessing because it’s proving a “relationship” between both Kang Hwi and Tae Ik). He quickly searches for his phone to call a reporter. Oddly enough, despite the scandal, the fan girls are sitting outside holding signs demanding Kang Hwi’s return while wearing masks with red exes over their mouths for a silent protest. The chairman then calls Joon and demands to know what is going on. Didn’t the chairman clearly state that something like this was definitely forbidden? Joon anxiously says he’s handling the matter and then says the earlier contract (with evil witch Se Ryeong) is going well). Two wrongs don’t make a right, idiot. 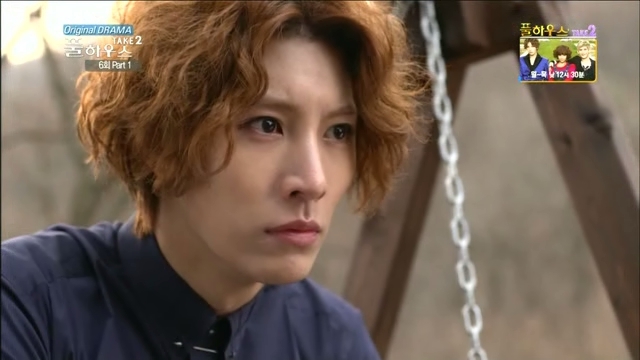 Tae Ik’s at the house where he recalls Joon’s angry words about finding Kang Hwi and stopping him before trouble starts. Where did Kang Hwi go? He went to the hospital with Man Ok back in his head-to-toe disguise. His ankle bone is cracked. When Man Ok asks how long it will take to heal, the doctor states that since Kang Hwi is a woman, it will take longer. LMAO! This surprises Man Ok and she shoots a glance at Kang Hwi who shrugs, eye’s laughing. Oh, yes. 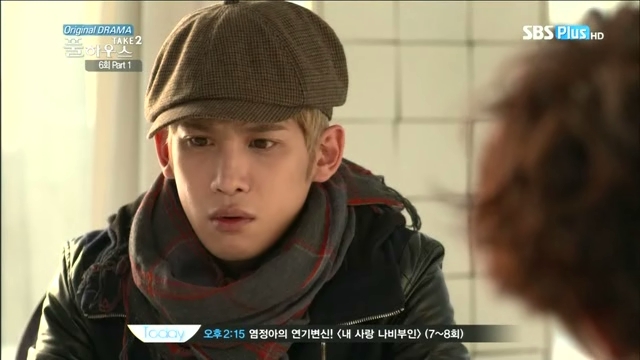 Park Ki Woong’s eyes can laugh. Their laughter over Kang Hwi being called a woman soon leaves when they hear that it can take upwards of four weeks. Man Ok helps him out to the waiting room and goes to pay the bill. He hands her his credit card. Man Ok initially refuses, but he insists that she take it. She does and goes off. 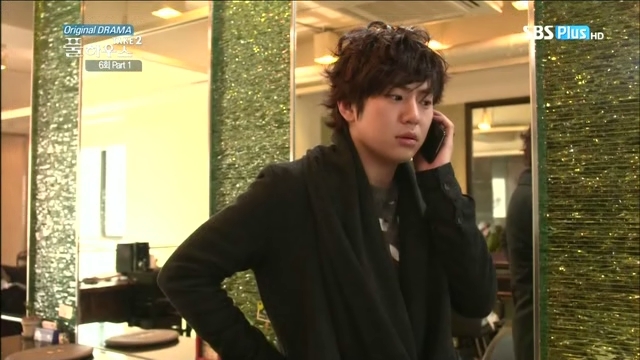 At this time, Tae Ik texts Kang Hwi and tells him not to use his cell or credit cards since Joon is tracing them. Kang Hwi panics and hobbles over to Man Ok to grab the credit card and renders it useless. Back in Full House’s basement, Man Ok asks if Kang Hwi has any idea who sent the text (IT WAS TAE IK!!! It had to be). Kang Hwi doesn’t know who’d be aware of the situation and there was no number listed. Hmm. Does Tae Ik have some type of throwaway emergency cell? Anywho, Man Ok wants Kang Hwi to come back to the dojo with her as he should be more comfortable there than in the basement. Kang Hwi refuses to leave until he finds the tape recorder. He then reminds her that she said it was dangerous there because of her friend. This makes Man Ok feel badly. If it wasn’t for Ga Ryeon, he would be able to stay at her house safely and not be subjected to a basement when he’s injured. 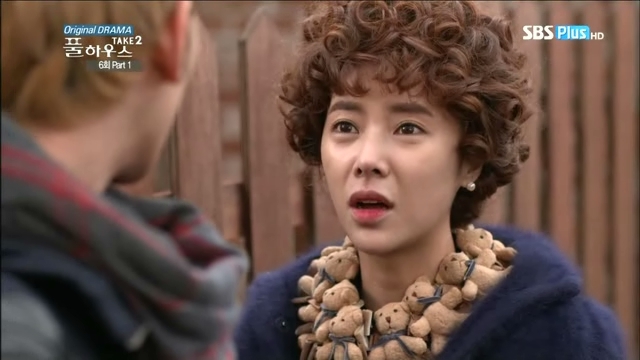 She then recalls Tae Ik’s angry words about her not being worried for Kang Hwi. She then asks if they can’t talk to him. Kang Hwi doesn’t think Tae Ik would help. Man Ok then reveals how worried Tae Ik was. Of course, Kang Hwi doesn’t believe her. Man Ok insists its true. She’s also noticed that while they fight, they do care about each other a lot. Of course, Kang Hwi also says that isn’t true. LIAR. She tells him to stop being like that and talk to Tae Ik once since he’s the only one who can help him at the moment. Man Ok helps Kang Hwi climb up the basement stairs. She gives him encouragement, but as they are about to go out, they overhear Tae Ik talking to Joon. To divert the fans’ attention from Kang Hwi, he wants Tae Ik to release a solo album. Tae Ik cannot believe Joon wants him to release a solo album now of all times. Joon can’t believe this. He’s finally letting Tae Ik make his long sought after solo debut. What’s the problem? Doesn’t Tae Ik remember what he said in China about not wanting to work on the same team as the jerk Kang Hwi? 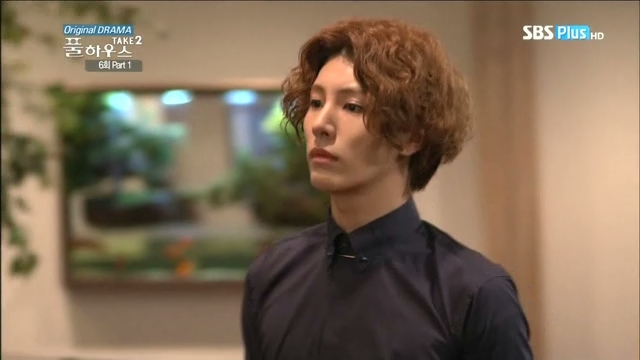 This hurts Kang Hwi and makes Tae Ik fuming mad. He yells out “president” and that’s where this episode ends. These two are always vocally against each other, but are also secretly worried and supportive. Don’t believe that Tae Ik doesn’t like you!!!! Now, what will happen with the new picture of Tae Ik and Kang Hwi? Looks like Joon is set to oust Tae Ik as well after the new picture surfaces. Aigoo. Aigoo. Now we have to wait for tomorrow and then the weekend is here and no new episodes until Monday. Sniffle.